South Korean food industry sales grew 2.3 percent in 2018 from a year ago to exceed 90 trillion won ($80.2 billion) for the first time, a report showed. 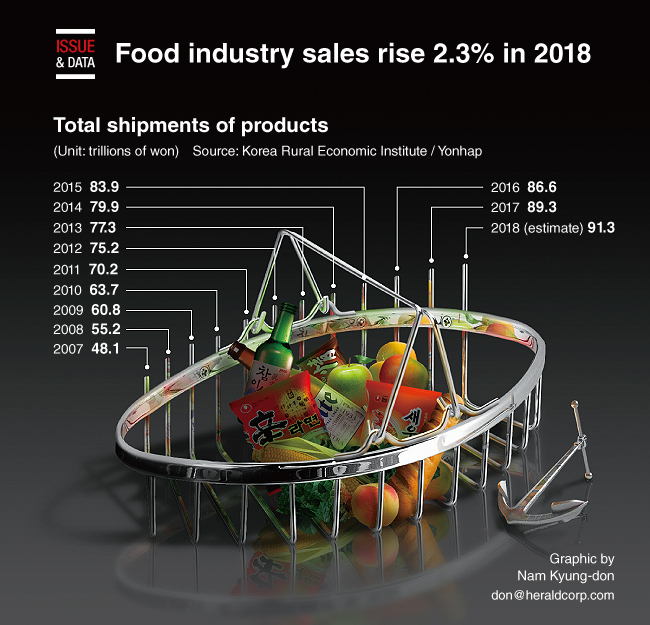 According to the report from the Korea Rural Economic Institute, total shipments of the nation’s food products, groceries and beverages came to an estimated 91.3 trillion won last year, up 2 trillion won from 2017. Food industry sales topped the mark of 90 trillion won three years after passing the milestone of 80 trillion won. Last year’s growth was led by grain-processing businesses (8.8 percent) and makers of feed and manufactured food products (7.2 percent).